"Pristine water. The way your corals want it. System Reef-resh� is an innovative method for true low-nutrient reef keeping. By harnessing the power of microbial activity, the system provides a natural and non-chemical solution to unwanted nutrients in home aquaria. A custom blend of bacterial strains with concentrations of over 80 billion cells/mL. In their planktonic state, these bacteria serve as a highly nutritious food source for corals and zooplankton. More importantly, these complimentary bacterial strains form nutrient consuming biofilms. A unique fusion of organic carbon sources enriched with amino acids. 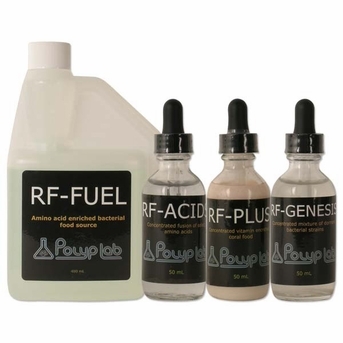 RF-Fuel is a safe but highly effective carbon-based bacterial food that will steadily improve water quality. The process is very gentle and it will not have any detrimental effects on your existing corals. The role of amino acids becomes critical in a low nutrient environment. RF-Acids is blend of specific amino acids that PolypLab research has shown to improve coral growth and colouration. Those that inhibit coral growth have been excluded from this highly concentrated mixture. RF-Plus is a water-stable mixture of liquid and solid coral foods that have been enriched with vitamins and minerals. Vibrant coral colouration results from regular use and is most noticeable for SPS corals. Additionally, unlike any other coral food, RF-Plus has been engineered to be free of nitrates and phosphates. How the system works: System RF is a innovative reef keeping method that is based on the growth and maintenance of bacterial colonies. The four components of the system are RF-Genesis, RF-Fuel, RF-Acids and RF-Plus. RF-Genesis contains a custom blend of bacterial strains. These specific strains of bacteria, in key ratios, are the backbone of the RF system. As planktonic free floating bacteria, the bacterial cells in RF-Genesis are consumed by corals and provide a form of nutrition commonly found in the ocean. As System RF matures, RF-Fuel acts as a bacterial fuel source and causes the strains in RF-Genesis to reproduce and form biofilms. These biofilms consist of microbes that feed off excess nutrients in your water column. These biofilms will eventually die off and will be removed by your skimmer. As the biofilms are removed, the absorbed nutrients are removed with them, creating a pristine environment. So how do corals obtain their energy in this low-nutrient environment? Planktonic bacteria will not provide the all of the necessary nutrition for corals. This is where RF-Acids and RF-Plus come into play. These two components of the System provide coral nutrition without spoiling the quality of your water. When used as instructed, RF-Acids and RF-Plus ensure that your corals will not starve in this low nutrient environment. These two components will provide excellent nutrition for vivid coloration and rapid growth of your corals. Whether you are a beginner hobbyist or a highly experienced reef keeper, System Reef-resh� will make a true low-nutrient environment much easier to achieve. By following the guidelines of System RF , hobbyists can achieve pristine water quality to create a near perfect environments in their home aquariums.